The SonoSim® Ultrasound Training Solution is easily customizable to match individual training needs, making it perfect for training healthcare professionals and students in ultrasonography. Individual, group practice, and institutional options are available. You are busy and time is a precious commodity. 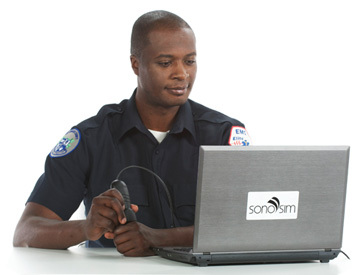 The SonoSim® Ultrasound Training Solution was created to allow you to access patients on-demand, anytime-anywhere, and practice hands-on scanning with the SonoSim® Probe on your personal computer. Avoid the cost, travel, and limited hands-on training experience associated with traditional ultrasound courses. You are excited about becoming a diagnostic medical sonographer (DMS) and are looking for a way to accelerate your ultrasound education and training. The SonoSim® Ultrasound Training Solution makes learning basic anatomy, sonographic image window acquisition and interpretation easy and fun. 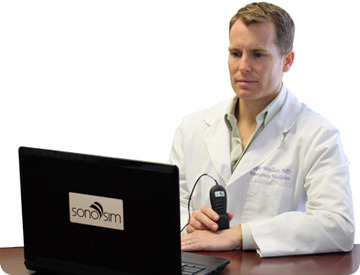 Access patients on-demand (anytime-anywhere) and practice hands-on scanning on your personal computers with the SonoSim® Probe. You are looking for ways to improve (e.g., IV access in a difficult-stick patient) or broaden your range of clinical skills (e.g., bladder imaging). The SonoSim® Ultrasound Training Solution is the easiest proven way for nurses, advanced-practice nurses, and physician assistants to learn ultrasonography. You are beginning to appreciate the immense value of learning how to use ultrasonography as an extension of your physical examination and as a tool in bedside clinical decision-making. The SonoSim® Ultrasound Training Solution is the easiest and most efficient method of preparing you to use the “Stethoscope of the Future”. You are looking to learn how to use hand-carried ultrasonography to assist you in your out-of-hospital medical care efforts (e.g., detecting tension pneumothorax during aeromedical transport). The SonoSim® Ultrasound Training Solution is the most comprehensive, yet easy-to-use ultrasound training solution available. You want your physicians to truly learn ultrasonography but have found the cost, travel, expense, and limited efficacy of traditional weekend ultrasound courses as obstacles. The SonoSim® Ultrasound Training Solution was created to allow your physicians to access patients on-demand, anytime-anywhere, and practice hands-on scanning with the SonoSim® Probe on their personal computers. It is the easiest proven-effective ultrasound training solution available. You are the Residency Program Director or Ultrasound Director and have grown to appreciate the challenges of providing uniform and high-quality ultrasound training. 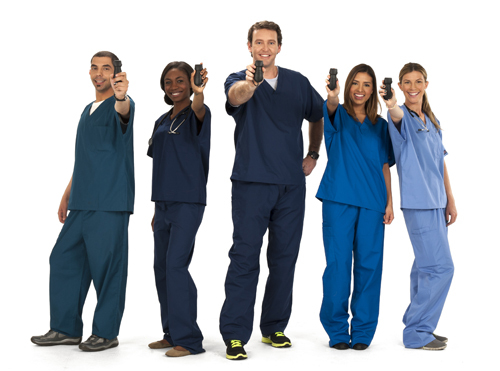 The SonoSim® Ultrasound Training Solution provides each individual resident the ability to access patients on-demand, anytime-anywhere, and practice hands-on scanning with the SonoSim® Probe on their personal computers. It is the easiest proven-effective ultrasound training solution available. 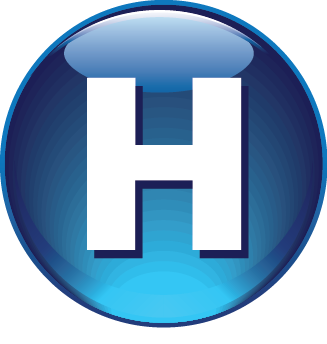 You are the Director of a Simulation Center and are seeking a cost- and time-efficient way of training a broad-spectrum of users (students, nurses, and doctors across specialties). Performance tracking and assessment is important to you. The SonoSim® Ultrasound Training Solution is the easiest proven way to learn ultrasound. 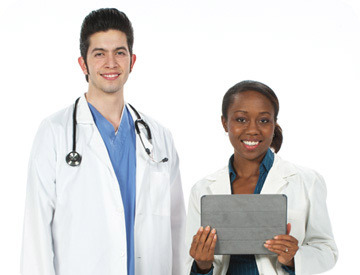 It provides users hands-on scanning, didactic courses, and knowledge assessments via laptop computer. You are a DMS Program Director and appreciate the challenges of providing uniform, high-quality ultrasound training to your students. 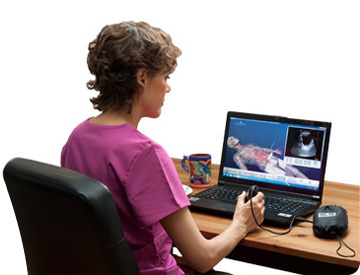 The SonoSim® Ultrasound Training Solution will provide your students the ability to access patients on-demand, anytime-anywhere, and practice hands-on scanning with the SonoSim® Probe on their personal computers. Students can scan real pathologic cases selected from the SonoSim® Case Library, which contains over 1,000 hands-on training cases. You are faced with the complexity and challenges of providing uniform, high-quality ultrasound training to hundreds of students. The SonoSim® Ultrasound Training Solution provides integrated didactic, hands-on training, and knowledge assessments in a flexible and customizable modular format. 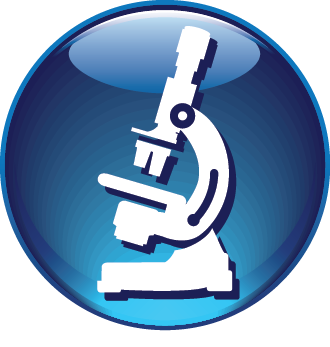 It easily integrates into a variety of medical school educational curricula. It will provide your students the ability to access patients on-demand, anytime-anywhere, and practice hands-on scanning with the SonoSim® Probe on their personal computers. As the group in-charge of developing your nursing school’s ultrasound curriculum, you have grown to appreciate the complexity and challenges of providing uniform, high-quality ultrasound training to hundreds of students. 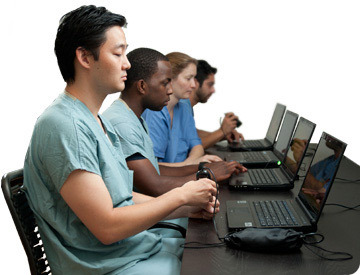 The SonoSim® Ultrasound Training Solution provides integrated didactic, hands-on training, and knowledge assessments in a flexible and customizable modular format that easily integrates into a variety of nursing school educational curricula. 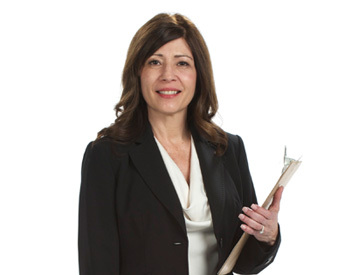 As a Hospital Administrator you have grown to appreciate the importance of ultrasound in reducing procedural complications (e.g., CMS Never Events). 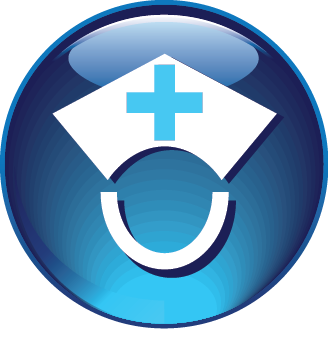 The cost and logistics of enabling uniform, high-quality ultrasound training across hundreds to thousands of careproviders is an obstacle. The SonoSim® Ultrasound Training Solution is a scalable, easy, and proven-effective way to provide uniform, high-quality ultrasonography training.